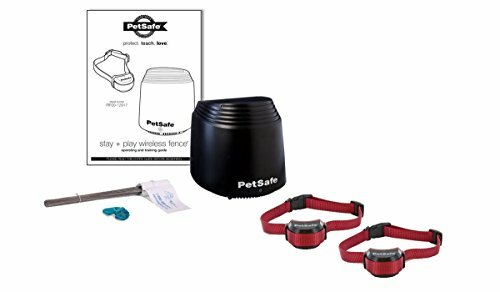 The Pet Safe Wireless Fence pet containment system is a revolutionary concept that provides the safest, simplest form of pet containment ever. Plug in the transmitter somewhere inconspicuous in your home. The transmitter emits a 17.5 kHz radio signal around your home. Your pet wears a lightweight receiver collar that "listens" for the signal. While the collar is receiving the signal, your dog is free to run and play in your yard. When he approaches the boundary of the signal area, he receives a warning beep. If your dog does not return, he receives a static correction which is startling but not harmful. With a little simple training, your dog will quickly learn his boundaries. 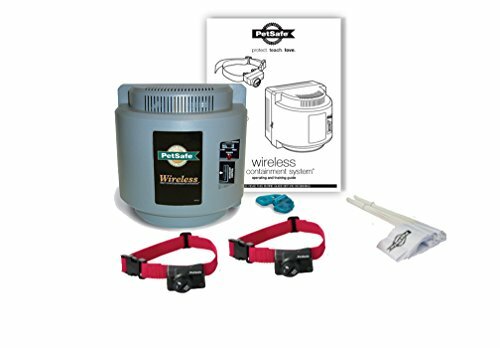 The training of your pet is a key element with the Pet Safe Wireless Fence. Follow the easy instruction and training manual that is included. 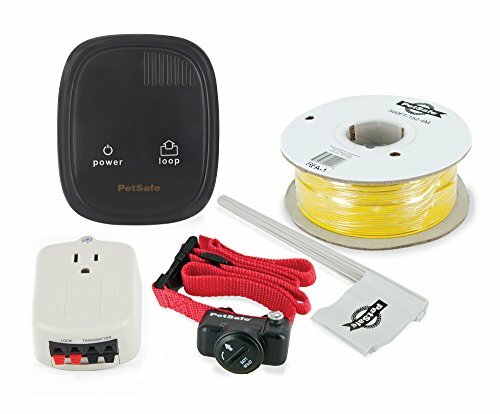 Have you decided on a PetSafe wireless dog fence? 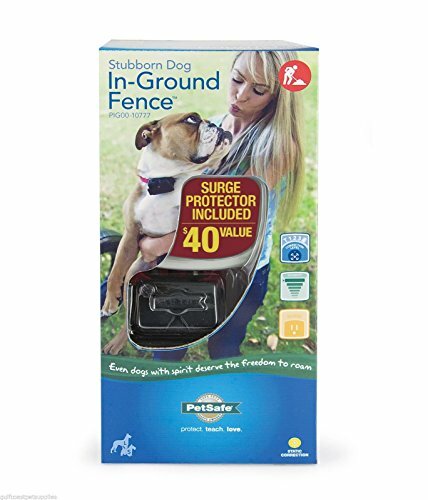 The Stay + Play Wireless Dog Fence is a customer favorite. This particular unit comes with stubborn dog collars that are perfect for large, strong-willed dogs or guardian breeds. The rechargeable collar is one of its most appreciated features. This system is ideal for taking along with you when you travel, since it is so compact and easy to set up. Do you need to contain a larger area than its capacity of ¾ of an acre? 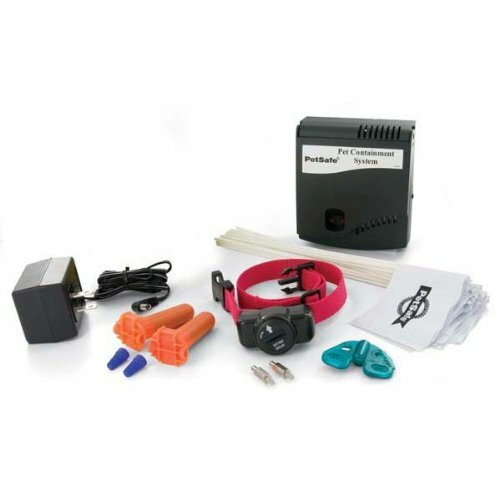 All you need to do is purchase additional Stay + Play wireless transmitters or standard PetSafe Wireless transmitters. Place the additional transmitter in a separate area to enlarge your containment area. 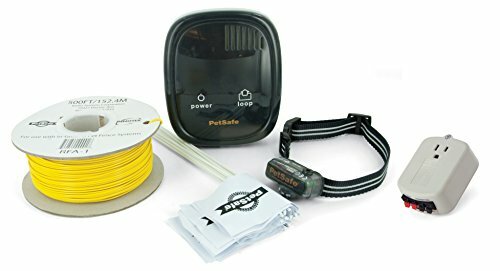 Will a wireless dog fence work for you? Before moving forward, be aware that there are several obstacles that can disrupt any wireless dog fence signal. These include sloping on your property, dense trees or heavy landscaping, a metal roof on your home, or a metal building within your containment area. These obstacles can cause your signal to be lost, resulting in your dog getting a false correction, or being able to get out of the containment area. 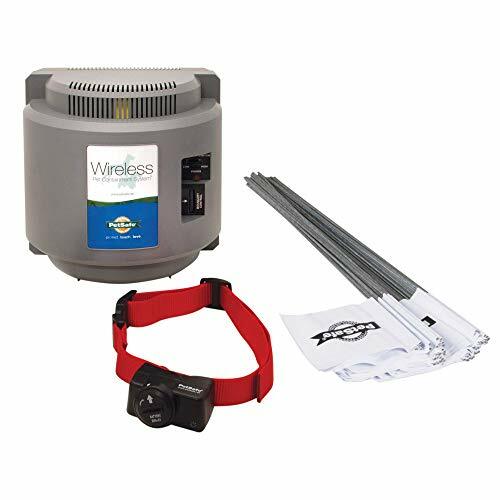 All PetSafe wireless dog fences come complete with a 1-year manufacturer warranty. The PetSafe Stubborn Dog fence system is designed for the stronger willed dogs with a high tolerance for that which is uncomfortable. This includes sport dog breeds, guardian breeds, and the medium to large dogs that are on the stubborn side.The collar has 4 higher intensity correction levels to work with, and includes a vibration warning feature coupled with the audible. PetSafe's In-Ground fence pet containment systems provide your pet with freedom and safety while costing thousands less than conventional fencing. It's quick and easy to install, reliable and safe, and with proper training, a very effective solution. A lightweight receiver is worn on your pet's collar, which picks up the signal and alerts your pet as he nears the underground boundary. Once your pet is properly trained, he will learn to stay in the boundaries designated by the radio fence. Includes 500 feet of boundary wire and 50 boundary flaps, enough to cover about one-third acre. For use in the US only. This unit is compatible with all US 110v outlets and are not to be used with 220v international voltage. The most advanced In-Ground dog fence on the market today. Featuring the Deluxe Ultra Light Receiver with 4 levels of progressive correction, if your dog attempts to run through, correction level increases until he turns back. You can increase of decrease the correction to meet your dog's training needs. Also has an anti linger feature and a low battery indicator. Safety features include protection against false signals and extra surge protection for storm-prone areas. Easy-to-follow operation manual and VCD. 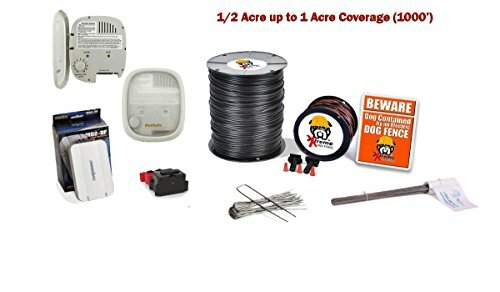 Includes 500 feet of boundary wire and 50 boundary flaps, enough to cover about one-third acre. For use in the US only. This unit is compatible with all US 110v outlets and are not to be used with 220v international voltage.